I just can’t resist the temptation of writing about something that makes me laugh hard enough to almost spit out my morning coffee. It’s one of the perks of the job. 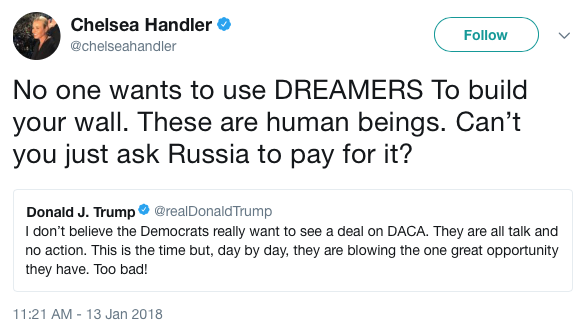 I can’t believe I’m about to say this, but I want to thank Chelsea Handler for giving me another opportunity to do just that. Oh, Chelsea. I’m so sorry. I had no idea you were so sensitive. I’m totally kidding! We all know the Queen of the Perpetually Offended — who ironically also intentionally tries to offend anyone who's not liberal — is one of the biggest heartless hags on any side of the Mississippi. Poor you! You had to spend a whole month in front of a reflecting pond at a ski resort while the rest of us do what you dread — work. My heart bleeds peanut butter for you. But, I’m so pleased that you’re going to “stay informed." And what, pray tell, is Handler’s idea of staying informed? It’s watching MSNBC’s Joy Reid, apparently. That was the “spitting out my coffee” part of this tweet for me. If your idea of staying informed is watching Joy Reid, then you must have absolutely no problem with someone who pushes a racist feminist narrative while falsely accusing people of things that have no merit. As far as Handler wanting her life back, it seems as though all of that “reflection” was periodically interrupted my moments of delusion. 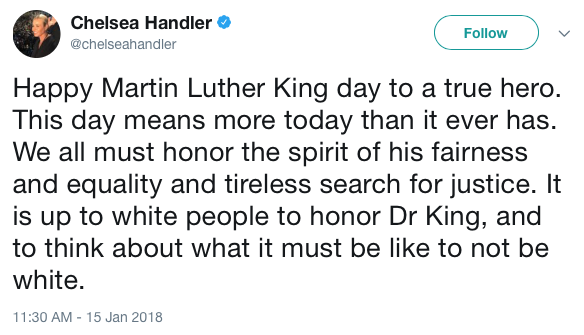 Throughout this supposed month of contemplation, Handler never took a break from tweeting out the same dumbass garbage we’re used to seeing from this artificially propped-up celebrity. Let’s take a gander, shall we? And? These women should win based on their qualifications and stances on policy. It shouldn't matter what gender they are. That's true equality. But, isn't it always the race baiters that claim that white people can never fully understand what it's like to not be white? 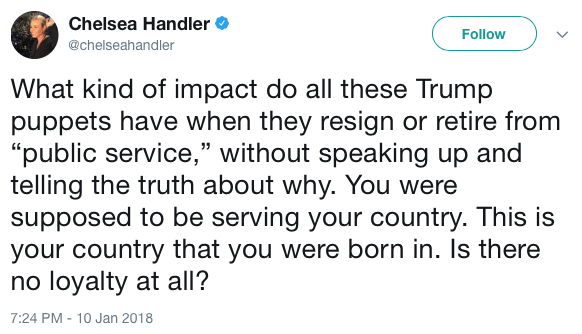 Handler's just another guilty white liberal. I don't know. Let's call the Clintons and ask! Says the same women who spearheaded the movement of celebrities saying that they would move to Canada if Trump won the presidential election. "Is there no loyalty at all?" If you can afford it -- and you need a break from life -- a ski vacation is a great way to relax. 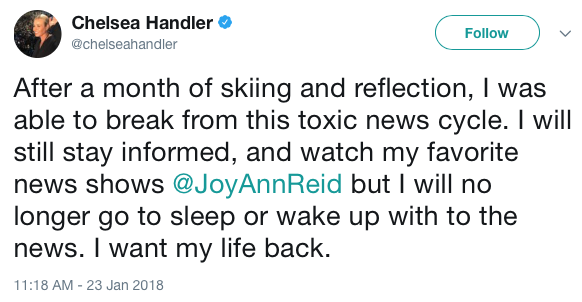 But, Handler never shut up the whole time she was "reflecting." Handler may not be able to "handle-r" it, but I can't feel bad for someone who is a constantly divisive, racist, sexist, baby-killing harlot.